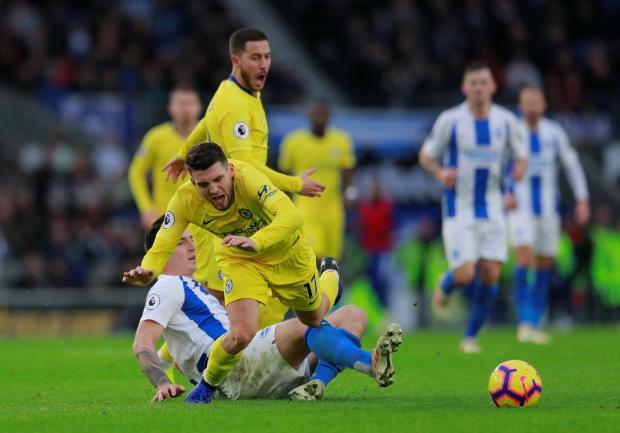 Mateo Kovacic is fouled during Sunday's match against Brighton. Chelsea consolidated fourth place in the Premier League with a 2-1 win at Brighton & Hove Albion on Sunday that became harder work than had seemed likely in the first half. Chelsea moved three points clear of London rivals Arsenal, who were beaten at Southampton. Regaining possession after his shot was saved, he played a perfect pass to give Pedro a tap-in. Brighton contributed to their own downfall 12 minutes from halftime with a poor clearance by Leon Balogun. From a position of apparent comfort, Chelsea came under pressure after Marcos Alonso had crashed a shot against the post. "We knew we needed to score a third goal, but we didn't and conceded," Hazard said. "You feel the pressure, but we managed the game well. "We want to be top of the league at the end of the season. We know Man City and Liverpool are good teams and we don't want the gap to be big."